Overview: The sequel to Zuma now on mobile! The object was an elaboration on the classic match-three puzzler. 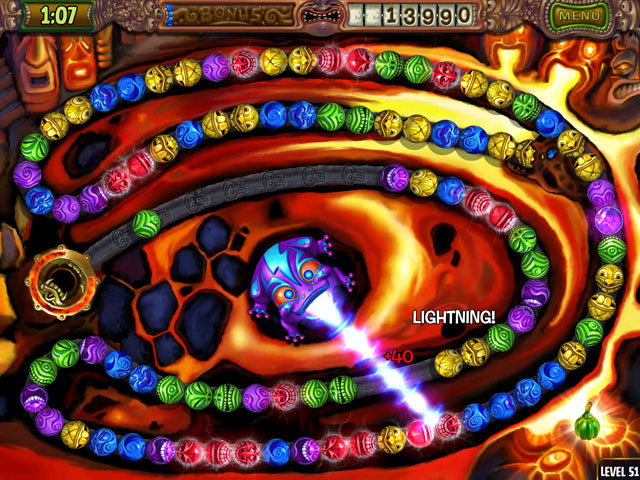 You control a frog that resides in the middle of the screen as a train of multi-colored orbs chugs along around you. If the orbs reach their destination, you lose, so you must stop that from happening. You do so by shooting orbs out of your mouth and making matches in the chain. Keep making matches until they're all gone and you beat the level. 1.1 Fix the Level 50 can not pass problem. 1.3 Fix some device can not save problem. 2.0 Fix save bug, all level can save!